A major part of being a homeowner is taking the steps to maintain the appearance, stability, and efficiency of the home. Wooden window frames add a special type of appeal to any structure, though to remain optimally functional and looking as classically wonderful as the day they were installed, repairs and maintenance will be occasionally required. At Mortice and Green, we repair any sash with professional attention to detail to help them retain their beauty and functionality for decades. Mortice and Green is a family run business with a team of well trained, experienced, and highly qualified professional restorative joiners. Each employee is dedicated to providing every client with the best service possible and results that are guaranteed to satisfy. As a leading window repairs company serving London and the surrounding areas, we are motivated to keep our customers happy with superior customer care from start to finish. 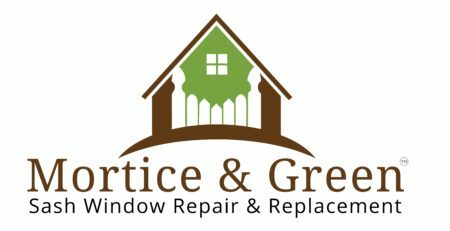 As a full service window renovation service, Mortice and Green can handle multiple tasks involving these types of windows. Some of the duties performed include replacing broken cords and pulleys, repairing rotting sills and frames, installing new ones, or performing a total restoration of the whole element. This team of professionals are even qualified to attend the needs of casement windows and wooden doors as well. Sashed windows have been used since the 16th century, and were especially popular in Europe. This is a classic design that is still popular today. One reason is that these wooden framed elements are constructed in a way that allows them to last for centuries with only basic routine maintenance. Many of the modern models that are made of hardwood have warranties of up to fifty years, which shows how confident manufacturers are in their products. Aside from being more durable and longer lasting than plastic or metal models, these architectural elements add a unique look and classic appeal to any structure. Their installation and maintenance is a great way to invest in a property as they add a lot of value to the home. This is especially beneficial when a homeowner is looking to make a good resell return as marketability significantly increases with details such as these. In many situations, it will be more affordable and beneficial to the homeowner to conduct repairs on their wood framed windows, than to replace them completely. These products can last for centuries if properly cared for, though from time to time issues may arise that require a bit of attention. When signs of potential problems manifest, calling a professional as soon as possible can prevent the trouble from becoming anything more serious. One sign that the windows may need to be attended is rattling. This does not always mean that the framing is loosening, or that something is broken. Sometimes the panels make the noise because they are imbalanced. Our experienced specialists understand the varied circumstances that might lead to this situation, as well as how to fix each of them. Another common issue are sashes that either do not slide properly or that will not stay put when opened. In these situations it might be necessary to replace certain components such as the locks and catches, pulley wheels, worn cords, the parting and staff beads, or even the timber of the frame. Movement is much smoother and holds are steadier when all of of these parts are kept in good condition. Perhaps one of the most common complaints is that the home is feeling drafty. When it comes to loss of heat and increased electrical bills, windows are one of the biggest offenders, costing homeowners excessive amounts of money each year. Our highly qualified joiners can handle this type of issue with no problem at all. To rectify the issue of drafty windows, brush piles are discretely integrated into the staff and parting beads which hold the window in position. This procedure effectively prevents air leakage and helps retain the desired temperature inside the home. This single insulating action can have a significant impact on one’s heating and cooling costs. Whatever a refurbishment of any type is done, it will include standard draft proofing as part of the general package. Homeowners who wish to just have the insulating process performed are able to contract it without any mechanical or renovation work required. Taking this step is something that will virtually pay for itself through energy costs savings in a matter of a short time. At Mortice and Green, although a small family owned business, the goal is to provide each and every client with a level of quality and customer service that is superior than anything a larger company can offer. Every job is given personalized attention to make sure the homeowner gets results that are not only efficient in functionality, but beautiful to look at as well. We take the preservation of such classic architectural elements to heart and treat each one with the utmost care. It is important that a homeowner be able to trust the contractor they select to work on such classic structural elements. One thing clients of Mortice and Green can always depend on is that their quotes will be completely based on work that is required, rather than what would be profitable to the company. The representative will provide an honest assessment on the status of the window, explain why each task is necessary, and only offer additional options if it is something that will benefit the homeowner in any way. In restoration cases, they will never promise to deliver results that are not feasible, but will give a clear explanation of what can be achieved. Renovations and refurbishments are processes that should always result in original wooden framed period windows looking and functioning as well as, or better than, intended. This means moving smoothly, staying in place whenever opened, no rattling, and better heating and cooling retention. For homeowners wishing to preserve the historical value and beauty of these architectural details, choosing a dedicated company such as Mortice and Green for their maintenance or replacement needs is a choice they will be glad they made.